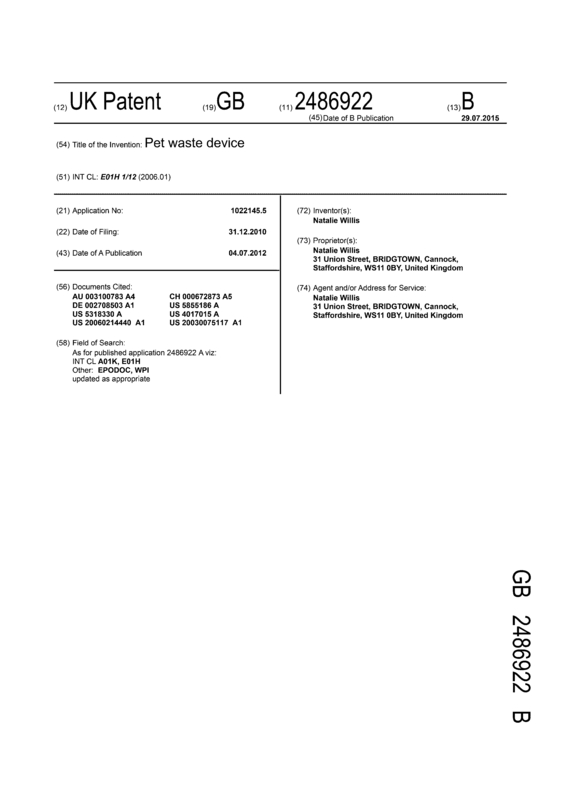 A pet waste device, more particularly a multi part device for dealing with, temporary storage of and disposal of pet (generally dog) waste, litter or faeces, comprises two segments 1,2, one of which may be utilised as a scoop and the other as a container. The device may have an upper segment 1 and a lower segment 2. The upper segment 1 may have a screw-threaded section 12 and cap 3 which may have a lanyard attachment point 30. The lower segment 2 may comprise a screw-threaded rigid annular ring 21 and a flexible majority portion 22. After unscrewing the segments, the user may grasp the flexible portion 22 and invert it, in the manner of a mitt, to reach through the ring 21 to grasp the waste. For more stubborn waste, the upper segment 1 may be used as a scoop. A bag may be used additionally. A seal may be provided between the segments 1,2.; The device may be made from non-permeable and anti-microbial plastics. Page created at 2019-04-23 6:46:52, Patent Auction Time.